Carolina Panthers are the only answer to this question. They even survived a logo change. Being uniform "normal" is now "abnormal". I remember when Washington State had 2 different helmets and how crazy and extreme everybody thought it was. My oh my, how far we have come. A program's brand is now week to weekl. I really like that look. I'm surprised they haven't used this look since they moved away from it in like 1990.They have used this look. Have you been living under a rock? Don't watch a lot of FL games out here on the West Coast. Plus, I'm not exactly the biggest Gator fan so I don't have the best memory when it comes to their uniforms.They've tended to lose in the orange. Surprised they're wearing them again. He's also wearing a shield that in no way fits that helmet/mask correctly. Noles new helmets in action and new practice jerseys. The white bumpers look so much better. I agree with that as well. I think they might have changed it already and we didn't know it yet?I hope they have made the switch and the new jerseys just aren't in yet. Winston was wearing the gold number jersey at ACC Media Days. The white numbers on the garnet jersey and the garnet numbers on the white jersey would look much better. The gold numbers are just gold overload with the gold helmet and pants. It's not awful, just simple. Who needs one hundred Photoshop layers and masks, etc.I'd say north Texas or South Carolina state may be worse. It's awful. Why on earth they didn't have chin straps on the helmets is beyond me. Just don't wear helmets. They look like kids playing dress up. And having one game opponent listed as TBD doesn't help either. 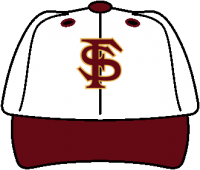 That's actually what I thought about this being a modernized cuff/collar trim that the Noles have worn since the mid 90s. And from what I've read, there WILL be garnet pants. And the tomahawks will remain on the helmets. Just get rid of those gold numbers and I'm starting to come around on these. Can everyone see in the background of this photo, the billboard style image in the background? If you look, there are leaders pointing to the different areas of the FSU pattern. You can clearly see fire and arrow labeled. Can anyone provide a full image of this showing what each level of the new Seminole pattern signifies? The middle section represents "man on a horse". The pattern is a legitimate Seminole tribe pattern. It's not something Nike just came up with. It's not chrome It looked chrome on that first teaser pick that just showed it coming out of the shadows. I've since seen it in full view and see it isn't.Official reports are that the gold mask helmet is NOT what will be worn. The gold with garnet mask is the primary look.These could've been much worse. Not as bad as I feared they would do. Love the font, it's from the last pro combats the Noles wore, and would have liked to have seen it put on the old jerseys. This is where the world of sports logos should be heading. Fantastic stuff. While I appreciate SMU not going the chrome or matte route, this is just an uninspired ugly helmet. The red helmet with red mask look has always been the worst looking combo IMO. This thing needs some blue and a white mask. Really don't understand what they are going for with this. And agree that it screams Calgary Stampeders! Those 2 UT logos are possibly the best updates I've seen on this site. They are certainly my favorites. Updated but keeping the vintage feel. Outstanding work. WOW! Excellent! This just screams for a series. The uniform doesn't look that bad, but the mannequin however.... That can't be them. They are sponsored by Nike. Yeah, they are. Maybe adidas gave a better deal for the one-time jersey? It's Georgia Southern, so I can't imagine adidas and Nike fighting over them... Southern tweeted this out earlier: That is one strange helmet. Was Ga Southern a teacher education college in this time period? Just my guess Yes. Georgia Teachers College. Guess the helmet is suppose to look leather.